Are you a Ugandan, a foreigner resident or a potential traveler who want to explore the pearl of Africa, the launching of Tulambule buses has made transport to all tourism sites all over Uganda easy. Early this year (2018), 5 buses were put on road four of which are 74 seaters and one an open roof double decker bus to ease the movement of travelers to all parts of Uganda for a gorilla trekking tour in Bwindi forets and Mgahinga gorilla national parks, chimpanzee trekking in Kibale Forest National park and game viewing safaris in savannah national parks all over Uganda. 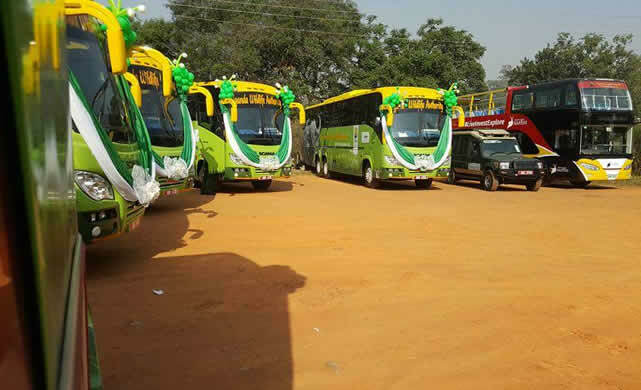 The buses were launched by UWA, a government body responsible for tourism and wildlife conservation in Uganda with the support of the government. The major aim of the newly introduced buses is to encourage domestic tourism in Uganda motivating Uganda’s to travel within their country exploring all that their country offers with no hindrance. For the past years, lack of transport has been a complaint for many Uganda’s since they would find it find to connect to Uganda’s remote areas where most tourism attraction are located. The lunching of Tulambule buses comes as good news for those who love to tour the country and appreciate the beautiful landscape, riches and nature. Right now, moving to, within and from all Uganda national parks has been made easy with travelers assured of comfort, spectacular views and their safety with the property they own which all result into a memorable experience. For the start, the launched buses will take travelers to the great Murchison falls national park, kidepo valley national park, Queen Elizabeth National Park, lake Mburo national park and semiliki national park among others. Many official people who among others include the state minister for tourism Uganda, miss tourism in the northern region and other members from the Board of governance from Uganda tourism Board and Uganda Wildlife Authority graced the launching of the Tulambule buses. The event took place at the head quarters of Uganda wildlife authority in Kampala Uganda. With the new buses, no more complaints are expected from Uganda since lack of transport has been a major excuse for limited domestic tourism in the country. The government and responsible tourism bodies realized a need for Ugandans to explore their country since tourism development starts from within. The ministry of tourism and the Uganda wildlife authority therefore expect an incre4saed number of Ugandan’s to take part in tourism hence promoting Uganda’s tourism industry.